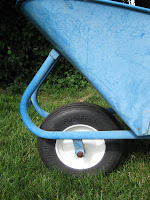 Buying a wheelbarrow? Replace that inflatable tire with a foam filled tire. Yes, that foam-filled tire/wheel combination may set you back an extra $35-40, but you will never again have to worry about a flat tire. Or purchase new inner tubes. Or buy that gooey "fix-a-flat" stuff. Or spend your first ten minutes in the garden each day with the air pump. This goes double for any gardener with an extensively thorny berry patch, where wheeling that barrow can easily cause punctures. Shopping for garden pruners? Buy quality pruning equipment, and shop at a store that also carries replacement parts for those pruners. That is also true when choosing any sort of garden cutting device, including needle-nose nippers (for cut flowers, fruits, vegetables), pruning hand saws, bow saws, loppers and chain saws. And don't base your purchase on brand name alone. Felco, Corona, Fiskars and other manufacturers do make high quality (and high priced) pruners. But they also may produce inexpensive lines of pruners for the big box stores and chain stores. For example, that $10 bypass pruner by Fiskars may not have replaceable blades, a replaceable latch or even the ability to disassemble the unit for cleaning, sharpening and oiling. But the $50 bypass pruners from Felco do have a removable nut so that you can replace and clean the blades, as well as being a better design that may be more comfortable for extended use. The cheaper models might last a year; a good hand pruner by Felco or Corona can last a lifetime, with proper care. One of my favorites is the Felco F-7 (pictured below, on the left). It has a rotating handle that eases the strain on the fingers and hand during a long day of pruning. 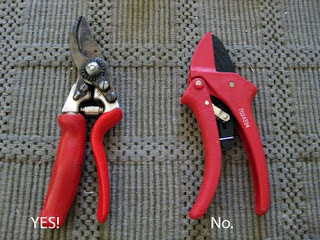 One other tip: for general pruning chores, choose bypass hand pruners instead of anvil pruners. Anvil pruners crush the stem, and can leave a messy cut that may invite pests and disease if that branch is alive. Anvil pruners are fine for your cut flower garden (sealing the moisture in the stem until you get the flowers into a vase of water) or for removing completely dead branches. For more information (and some rather stern opinions from local gardening experts), here's a link to more about Anvil vs. Bypass pruners. When choosing your first drip irrigation system, buy it from a store that's going to be in business for a long time. That store will be your best source for add-ons and replacement parts for your particular system. An irrigation supply store is the best place to shop. 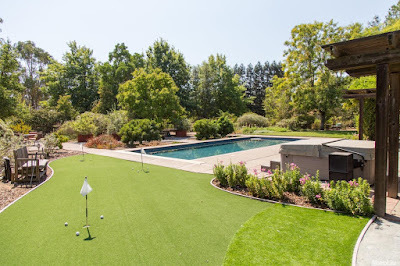 Or, choose a reputable online irrigation store, such as Dripworks, based in Willits, California. There is no uniformity among manufacturers when it comes to their "half-inch tubing" sizes. The outside diameter of that half-inch mainline drip tubing can range from .620 to .710, depending on the manufacturer. Which means that shopping for fittings, especially couplers, can be a a daunting experience if you're shopping at a different store. The good news: there are universal couplers available that are adjustable to fit most half inch tubing. The bad news: in my experience, they break down after too many years in the sun. Bury them under some mulch for a longer life. A tip: Not sure what size fitting you need for your drip line? Take a piece of your existing half inch tubing with you to the store, to make sure that the fittings (couplers, tees, elbows) you purchase will, indeed, fit. Another tip: note the color on the ends of the couplers, tees, and elbows that you already own and use. Buy the same color when shopping for more of those parts. One more tip: Shopping for drip fittings and you don't have that spare piece of half-inch pipe with you? Let your finger be your guide. Go out to the garden. Stick your little finger into the opening of one of your existing couplers, tees or elbows. How far does your little finger slide in? Remember that point on your finger, and then you can shop for couplings by "trying them on". 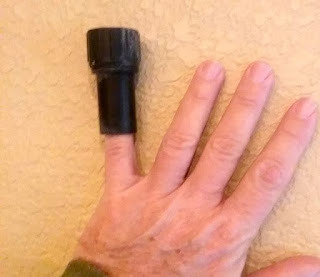 Another good reason to always carry hand sanitizer: it might help you get those couplings off your finger if they get stuck. 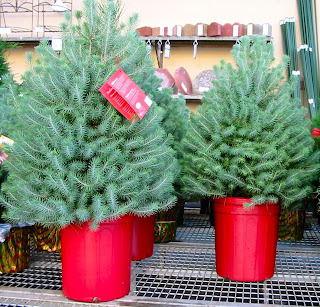 Looking for an alternative to the annual holiday household display of a decorated dead evergreen? • Aleppo, Mondell or Afghan Pine. Also called Pinus eldarica or Pinus halepensis. These evergreens can take sun and wind. As an added bonus for those who own acreage, these pines are good for windbreaks and erosion control. 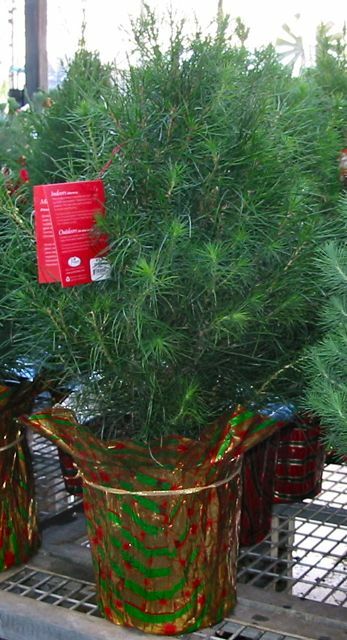 Rapid growers, these pines with gray-green needles can get to 30 to 60 feet tall with a 20 to 30 foot spread. They aren't that thirsty, either; a deep, twice a month watering is all they require during the summer. • Italian Stone Pine. Another good choice for the interior valleys. Can take heat and drought when established. Has a moderate rate of growth to 60 feet. • Colorado Blue Spruce. Can take sun, shade and cold, but is susceptible to spider mites. Likes most soils, as long as they're well-drained. 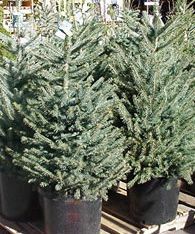 This tree with the bluish needles is a slow grower that will eventually get 60 to 80 feet tall with a 40 to 50 foot spread. • Deodar Cedar. A tree that actually prefers clay soil, as long as there's no standing water. This evergreen can take sun, wind and heat. It's a rapid grower that will reach 50-80 feet with a 40-foot spread. Aptly known as, "The California Christmas Tree". • Don't keep it in the house for more than a week. • Keep it away from heating vents, wood stoves and fireplaces. • Water the tree every day while it's in the house. A good way to insure a slow, thorough watering is to dump a tray or two of ice cubes into its container. • Decorate it with the smaller, cooler, flashing bulbs. 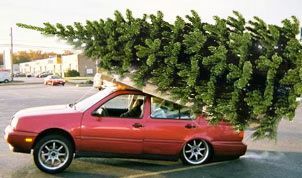 • The tree can remain in a large container for a number of years, but you may need a furniture dolly to move it in and out of the house. 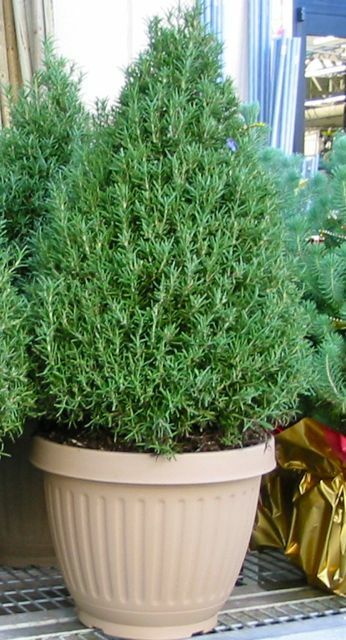 Given a little care, the dwarf Alberta Spruce can survive as an outdoor living Christmas tree here. Give it afternoon shade for best results. Coast Redwood (Sequoia sempervirens). Give this tree plenty of room in the yard. 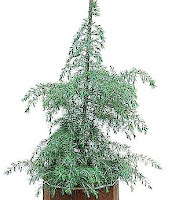 The coast redwood can get 70 feet tall with a spread at the base of 30 feet. It can take our sun, but needs frequent, deep watering, probably more water than our wallets should spend on plant survival. During the last decade, many coast redwoods have been suffering from crown rot diseases, with extensive dieback, usually starting in the upper canopy of the tree. Our area's propensity for years-long drought conditions may be causing the coast redwood to be a poor choice for a long life here. Limber Pines (Pinus flexilis), native to mountainous areas, tend to revert to rounded tops as they age. The exception is the "Vanderwolf Pyramid" variety, which keeps its Christmas tree shape. Another one to be wary of is the Grand Fir (Abies grandis). This tree could soon overwhelm a small yard, reaching heights of 200 feet. Other borderline trees that may have trouble here in the Valley include the Tempelhof cypress (Chamaecyparis obtusa) and the Blue Point Juniper (doesn't like too much water or slow draining soil). 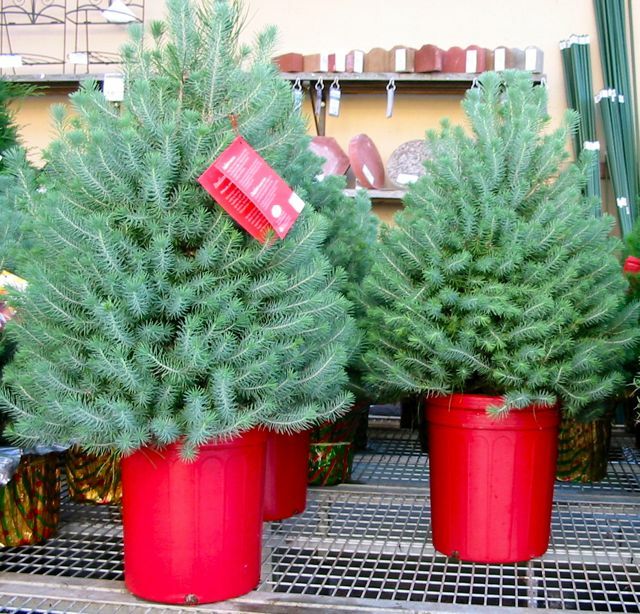 At the top of Santa's horticulturally naughty list is the Monterey Pine, which is better for coastal environments; even in its native environment, Monterey Pines are in decline due to pine pitch canker. Here in the valley, the Monterey Pine is susceptible to pests, diseases and sulks in our summer heat. Another Christmas-tree type plant that is widely available here is the Norfolk Island Pine. Known as the Hawaiian Christmas Tree, this is best planted outdoors...in Hawaii. Here, it makes a good house plant year round. When is a Christmas tree not really a tree? When it is a Rosemary plant, an evergreen shrub that's been pruned into a pyramidal shape. This herb is a great addition for its culinary and bee attracting qualities (blooms in the winter and spring), but would require constant shearing to keep it looking like a Christmas tree...uh, bush. After being diagnosed with four cholesterol-jammed heart arteries in March 2012, I underwent quadruple coronary artery bypass graft surgery in April of that year. 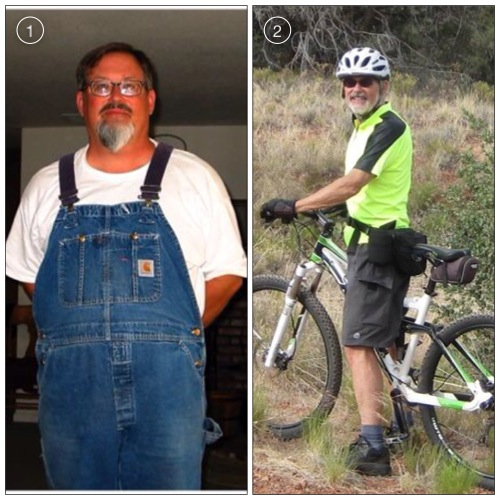 At the same time, I was told (to my surprise) I had full-blown Type 2 Diabetes (A1C of 10.4). The surgery went well and the long road to healing from heart disease and diabetes began. Thanks to regular exercise and a healthier diet, I lost 60 pounds, the arteries that now service my heart are still flowing without problems, the blood sugar levels are way down (A1C = 6.0), and within eight months of surgery, I no longer needed to take any prescription medications for either of these ailments. With the doctors' blessings, of course. It's now five years later, and I am still prescription free, with the help of good food and regular exercise. How did I do it? Here are some tips I use every day. Remember: I am not a doctor or nutritionist. I’m just a guy. A guy lucky to be alive, who could've easily keeled over and died back in March 2012. But I'm still here, riding my bike 100 miles a week. Maybe some of these tips can help you! • WEIGH IT. MEASURE IT. Get a small kitchen scale with a Tare weight (unladen weight) function. Pay attention to serving size, calories per serving, sugar and fiber content. What are the first ingredients listed? Avoid foods where sugar is in the top 3. Is the first ingredient whole grain, or flour? Choose whole grains. • ADDED SUGAR IS YOUR ENEMY. Too much sugar in the diet can make you susceptible to many diseases, not just heart disease and diabetes. Read “Fat Chance” by Dr. Robert Lustig for more information. • SOLUBLE FIBER IS YOUR FRIEND. Studies at the Mayo Clinic and other institutions have shown that soluble fiber may help lower blood cholesterol levels by reducing low-density lipoprotein, or "bad," cholesterol levels. Soluble fiber may have other heart-health benefits, such as lowering blood pressure, blood glucose levels and inflammation. • SMALLER PLATES, SMALLER SERVINGS. • THE KITCHEN CLOSES AT 730 P.M.
Mindless evening calories can kill you. • EAT MORE FIBER. EAT LESS SUGAR. My goals: at least 35 grams of fiber per day and less than 45 grams of added sugar per day. Choose foods with more fiber than sugar. • SHOP FOR BREAD FROM THE FREEZER, NOT THE SHELF. • CHOOSE WHOLE GRAIN BREAKFAST CEREALS. • ADD WHOLE FRUIT, NOT SUGAR, TO CEREALS. When you bite into a piece of fruit, the fruit’s fiber helps slow your absorption of fructose, the main sugar in most fruits. • DON’T DRINK YOUR CALORIES. Too much sugar! And that includes fruit juices. • GOT A WATER COOLER? Go here instead of opening the refrigerator, looking for something to drink. • BECOME THE SHOPPER, BECOME THE COOK. • SHOP THE PERIMETER OF THE SUPERMARKET. That’s where the healthiest foods can be found: fruits, vegetables, dairy, meats. But read the label of dairy products for hidden sugar! • DON’T SHOP AT COSTCO BEFORE LUNCH. And stick to your shopping list. Hunger = impulse buying. • TURN OFF THE TV AND COMPUTER. Start counting the ads for unhealthy food and drinks. You are being seduced! • LET’S GO FOR A WALK! Walking helps maintain a healthy weight; helps prevent or manage heart disease, high blood pressure and type 2 diabetes; Strengthens your bones; Lifts your mood; Improves your balance and coordination. Walking can burn 200-400 calories an hour. • QUALITY SHOES, QUALITY SOCKS. Choose shoes made for walking or hiking. Measure your foot in the late afternoon for a correct fit. Hiking socks with cushioned soles will make a difference. For cardio, weight training and comraderie. According to the Mayo Clinic, strength training also helps you: Develop strong bones, reducing the risk of osteoporosis. Controls your weight. Boosts your stamina and balance. Manages chronic conditions, including back pain, arthritis, obesity, heart disease and diabetes. • THE MORE YOU EXERCISE, THE MORE YOU CAN EAT! Remember, you only count “net calories” (Total calories – calories burned exercising). Mayo Clinic: Get at least 150 minutes a week of moderate aerobic training. Do strength training exercises at least twice a week. • YOU CAN’T OUT-EXERCISE A BAD DIET. Exercise does not negate the bad effects of consuming too much added sugars as your “bonus calories”. • BE YOUR OWN CHEERLEADER! Try it for one day. The next day, use your previous day’s success to move you forward. • SURROUND YOURSELF WITH BELIEVERS. • HOW DO YOU FEEL? WRITE IT DOWN! Put it in your food notes. I’ve noted a correlation between down moods and the aftermath of excess sugar consumption. • FIND YOUR NATURAL VALIUM. A walk in a garden, an easy bike ride, enjoyable music, petting your dogs and cats! • NAPS ARE GOOD. SLEEP IS GREAT! Research by the National Institutes of Health shows that lack of sleep increases the risk for obesity, heart disease and infections. Get 7-8 hours a night. • EVERYDAY IS A NEW DAY! The beauty of looking at the online calorie counters such as My Fitness Pal or Calorie King: everyday starts with a blank slate. • IT’S NOT A DIET; IT’S A LIFESTYLE. You “lose” car keys, cellphones, or pets. You hope they come back. Don’t “lose” weight. Get rid of it, permanently! Don’t overdo exercise at first. Work up to the recommended amounts. Choose healthier food alternatives: non-fat milk instead of low-fat milk instead of whole milk; lite salt, Mrs. Dash salt-free seasonings, meat substitutes. Salsa instead of ketchup, pico de gallo instead of salsa. • ENJOY THE SIDE BENEFITS! For me, the migraine headaches disappeared, more energy, less body aches, and new clothes that fit! • YOU’RE NOT TOO OLD TO ACHIEVE BETTER HEALTH! People who eat right and exercise can substantially reduce their risk for cardiovascular disease and death even if they’re in their 50s or 60s. According to the American Journal of Medicine (July 2007), a multi-year study showed that older adults who exercise at least 2.5 hours per week, maintain a healthy weight, don’t smoke and consume at least five fruits and vegetables daily will lessen their chances of heart trouble by 35 percent, and the risk of dying by 40 percent, compared to people with less healthy lifestyles. • YOU CAN DO IT!!! 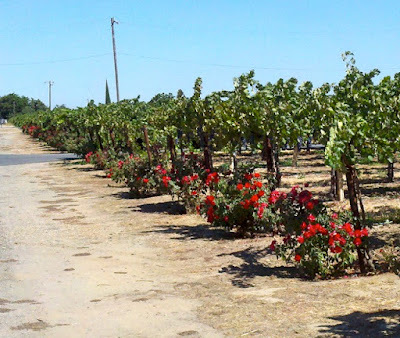 c) Red roses mark the rows of red wine grapes; white, the white wine grape varieties. d) is correct. Different strains of powdery mildew attack roses. Insects that bother both would attack the grapes first. And if the color of the rose indicated the varietal, then an apricot colored rose would mean that they are growing grapes for Boone's Farm Strawberry Hill wine. Sacramento County Farm Advisor and Viticulture specialist Chuck Ingels says the practice may have been tried in Europe a long time ago to detect powdery mildew early, but it doesn't work. The mildew species that attacks grapes is a completely different species from that of the rose powdery mildew; and, they have different temperature requirements. Also, roses are more prone to get aphids; grapes, not so much. Powdery mildew species on grapes: Erisiphe necator. 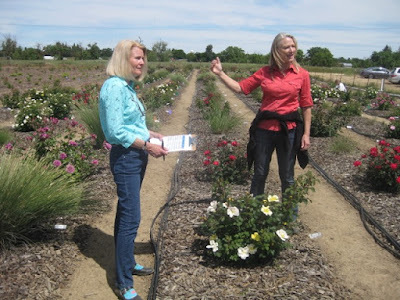 Viticulture instructor Andy Walker at UC Davis says that roses are planted strictly for aesthetics. This practice probably started in the early 20th century and continues to today; the myths and the stories about it came along the way. No winemaker is going to rely on roses to tell them about the quality of the wine. But it certainly impresses visitors; and, they probably bought more wine because of this sophisticated-sounding yarn. "Alternating fungicides with different modes of action is essential to prevent pathogen populations from developing resistance to classes of fungicides. This resistance management strategy should not include alternating or tank mixing with products to which resistance has already developed. Rotate with fungicides that have a different mode of action. Research has shown that sequential sprays of products with the same mode of action can lead to the development of reduced sensitivity to the active ingredient(s). Some fungicides have two active ingredients and thus two modes of action. When using such materials, do not alternate with other fungicides that contain one of the same modes of action (i.e. they represent the same fungicide class)." Home gardeners and organic growers have a more limited selection to control powdery mildew. "Powdery mildew is a perennial problem in grapevines. Sulfur, horticultural oils, neem oil, jojoba oil, and Serenade are registered for controlling powdery mildew in home vineyards. Begin applying treatments when all buds have pushed. Thereafter, repeat at 10-day intervals if disease pressure is high; otherwise, extend intervals when temperatures are above 90°F until the sugar content of the grapes is 12 to 15%, which is when they begin to soften and approach ripeness and are no longer susceptible to infection. You can measure the sugar content with a refractometer, if you have access to one, or you can see if sample berries sink in a 15% sucrose solution. (Prepare the sucrose solution by dissolving 8-1/2 teaspoons of table sugar in a half cup of warm water, then mixing in enough cold water to make the total volume 1 cup.)" Fungicides. Several less-toxic fungicides are available for backyard trees and vines, including horticultural oils, neem oil, jojoba oil, sulfur, and the biological fungicide Serenade. With the exception of the oils, these materials are primarily preventive. Oils work best as eradicants but also work as good protectants. The fungicides listed here are registered for home use. Oils. To eradicate powdery mildew infections, use a horticultural oil (such as Saf-T-Side Spray Oil, Sunspray Ultra-Fine Spray Oil) or one of the plant-based oils such as neem oil (such as Green Light Neem Concentrate) or jojoba oil (such as E-rase). Be careful, however, never to apply an oil spray within 2 weeks of a sulfur spray or plants may be injured. Some plants may be more sensitive than others, however, and the interval required between sulfur and oil sprays may be even longer; always consult the fungicide label for any special precautions. Also, oils should never be applied when temperatures are above 90°F or to drought-stressed plants. Horticultural oils as well as neem and jojoba oils are registered on a wide variety of crops. Sulfur. Sulfur products have been used to manage powdery mildew for centuries but are only effective when applied before disease symptoms appear. The best sulfur products to use for powdery mildew control in gardens are wettable sulfurs that are specially formulated with surfactants similar to those in dishwashing detergent (such as Safer Garden Fungicide). To avoid injury to the plant or tree, sulfurs should not be applied within 2 weeks of an oil spray, used on any plant when the temperature is near or over 90°F (80°F for caneberries and strawberry), and never applied at any temperature to apricot trees. Biological Fungicides. Biological fungicides (such as Serenade) are commercially available beneficial microorganisms formulated into a product that, when sprayed on the plant, inhibit or destroy fungal pathogens. The active ingredient in Serenade is a bacterium, Bacillus subtilis, that helps prevent the powdery mildew from infecting the plant. While this product functions to kill the powdery mildew organism and is nontoxic to people, pets, and beneficial insects, it has not proven to be as effective as the oils or sulfur in controlling this disease. As we age, the spirit is willing, but the flesh is weaker...when it comes to gardening. The good news is: we have the experience and wisdom to garden smarter as we get older. Our enjoyment of growing fruit, flowers and vegetables seems to increase as the years fly by. Maybe it's because we've come to better appreciate how nature works. Maybe it's because we enjoy doing things closer to home. Or, maybe it's because plants don't talk back. Whatever the reason, one thing is for certain: we don't bend down into a flower bed, lift bags of fertilizer and pull weeds as easily as we used to. As a result, we know that a few hours working briskly in the yard may result in an evening of moving slower. Still, there's no reason why you can't enjoy the good exercise of gardening (burning up to 7 calories a minute!). Just get rid of those tasks that are monotonous or excruciatingly difficult. Here are some tips for implementing an easy-care garden for the Golden Years, advice that can be summed up in four words: automate, elevate, eliminate, delegate. • Automate. Provide your garden with an automatic watering system. The efficiency of an automated sprinkler or drip irrigation system protects your plants from the summertime heat when you're away from home. And, a good drip system reduces water usage, unwanted weed growth and plant diseases. Replace your old irrigation control system with a model that can control more valves with more flexibility. 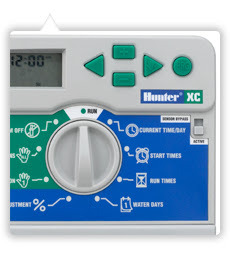 For example, the Hunter line of irrigation control systems automatically adjust water run times based on the season and the weather. And it will automatically turn off your sprinklers if it senses rain. 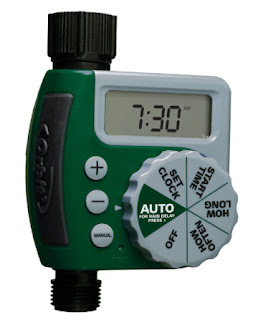 Consider installing battery operated water timers at distant faucets to control the watering of garden beds. The better ones not only turn the water on and off, but offer extended run times (perfect for drip irrigation) as well as multiple cycles per day (perfect for watering container plants on hot summer days). Install low-voltage night lighting, equipped with sensors, to automatically come on at sunset throughout the yard. • Elevate. Build raised planters for your flowering plants and vegetables. 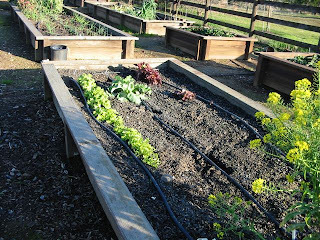 Not only do raised beds reduce the amount of stooping and kneeling that are a necessary part of gardening, raised beds provide better drainage for plants that don't like "wet feet". Built of wood, concrete or brick, a raised bed, 18-24 inches high, gives you a place to sit while weeding, pruning or harvesting. Make the raised beds any length you desire; but keep the width less than four feet across for ease of reaching into the middle of the bed. And lining the bottom of these beds with quarter-inch mesh hardware cloth will keep gophers from sampling the fruits of your labor. • Eliminate. Life is too short to put up with a problem plant. Why waste time fretting over a habitually under-performing perennial, shrub or tree? Why tolerate tree litter or plant roots that are upheaving concrete? If it is growing awkwardly or is consistently pest infested despite your best efforts, get rid of it. Purchase another plant that will do better. Although the attempt to totally eradicate weeds is an exercise in futility, adding three or four inches of mulch, such as a walk-on bark, can dramatically reduce the amount of time you spend pulling weeds. If you really want to cut down on a monotonous garden chore, save money and time...get rid of the lawn! Mowing, edging, weeding a lawn can average an hour a week. Replace that ongoing chore with a garden area that is beautiful, uses much less water (with the right plants), and eliminates most weeding (thanks to several inches of mulch). The area you see above was 1200 square feet of a bermudagrass lawn in nearly full sun. 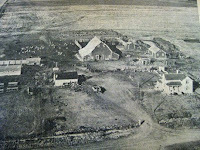 It was an area that was a lot of work to maintain and keep irrigated, and offered none of the benefits of a real garden. We replaced that lawn with what you see here: a fountain (that attracts birds and beneficial insects), dwarf fruit trees (such as the Garden Gold peach) and blueberries in containers, as well as native plants such as California buckwheat that attracts beneficials and pollinators. The best part? That area now uses 88% less water than the former lawn. 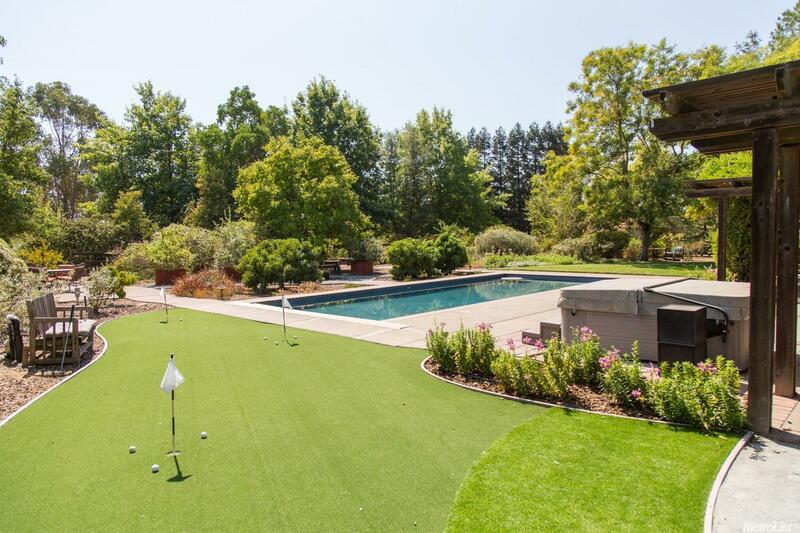 And although it may sound heretical coming from me, there's nothing wrong with ripping out an underperforming turf area and replacing it with...an artificial turf putting green (top picture). • Delegate. Somewhere in your neighborhood, there is the teenager looking to pick up some spending money doing yard chores (I know, that's like searching for the Holy Grail! ); but there may also be the guy or gal who has that tractor, front loader, chipper-shredder, backhoe or whatever that could accomplish in a fraction of the time what you are attempting to do with a shovel, small mower or saw. Ask your neighbors for recommendations for professional landscapers and arborists. Check your home owner's insurance for coverage...and then seek them out. Parceling out yard work to others is tough for gardeners; but grit your teeth, open your wallet...and save your back. How Can I Improve My (Expletive Deleted) Clay Soil? From the garden e-mail bag, Gordon of Lodi writes: "I've about had it with clay/hard pan soil. The soil map for Lodi/Stockton says we are supposed to have sandy loam. Give me a break! I bought a 30 lb. bag of gypsum pellets and I'm willing to dig it in everywhere. But, how much do I use? I found an article online. It says to add 20-30 lbs. per 1000 sq. 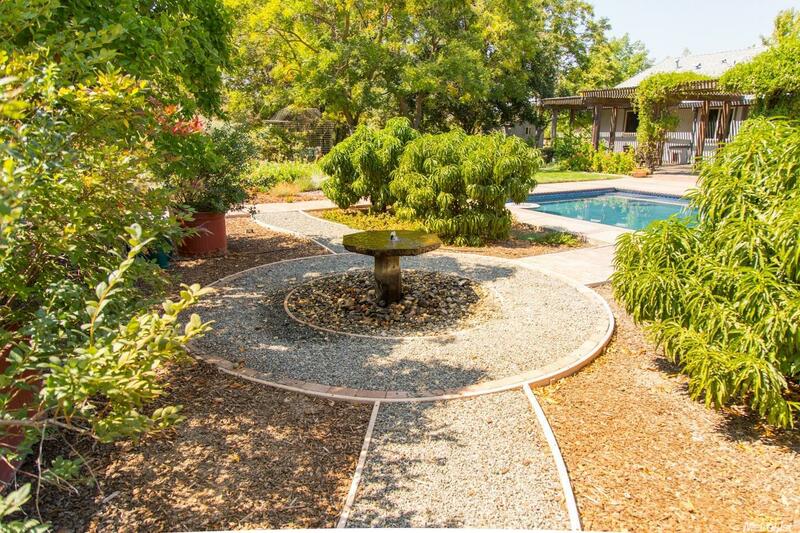 ft. of garden area. I'm not going to work up 1000 sq. ft.! How about a cup full in 10-20 sq. ft. every three years?" Gordon, how about getting a soil test done first? California's Central Valley is made up of many different soil types, so yours may not be representative of what you researched. Gypsum is effective on soils high in salts; it does nothing to improve the permeability of our clay soils, most of which do not have a salt issue. Still, only a soil test can determine that. By the way, gypsum is very slow to work. It needs to be added (for that salinity problem) on a regular annual basis, not once every three years. 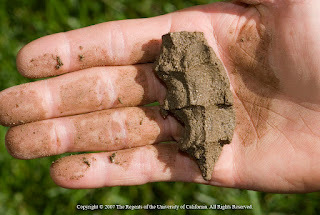 Usually, the reasons for the expletives used against clay soil include symptoms such as slow draining soil, difficult to dig soil, or hardpan layers. This time of year, especially after a rainy winter, compaction of clay soil is not uncommon (quit walking on wet clay soil!). Don't want to be a scientist? Then, build a raised bed and plant in that, using a high quality commercial soil mix. To improve water penetration, be sure to mix in some of the new soil into the existing soil base at the bottom of the raised bed. If you want to improve the soil drainage and permeability of your existing clay soil, add quality compost, top the soil with several inches of mulch, and grow a cover crop. 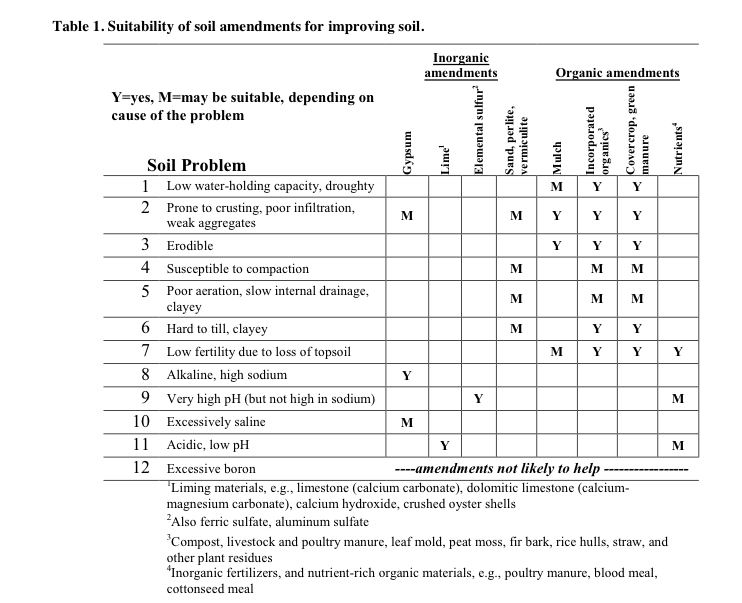 The Yolo County Master Gardeners put together an easy-to-understand chart of soil symptoms and possible solutions. More info is available in their online publication, "Using Soil Amendments in Yolo County Gardens." A word of warning about one of those suggestions: adding sand, perlite or vermiculite to your soil may be counterproductive. According to retired college horticulture professor Debbie Flower, "I would not add those to my field soil: Too little sand added to clay = cement. Perlite is ugly (and it tends to rise to the surface). Vermiculite just compresses when soil is worked or walked on." Myth #1. Gypsum softens clay or loosens compacted soil. Gypsum (calcium sulfate dihydrate) is effective in counteracting the effects of sodium, which in excess (in soil or in irrigation water) causes soil aggregates to disperse, sealing the soil surface and reducing water infiltration. The calcium in the gypsum replaces the sodium, making for more stable soil aggregates, which do not disperse and form a seal so readily. This process is the basis for the misleading claim that gypsum “loosens” the soil. Gypsum does not reduce or prevent soil compaction, dissolve hardpan, soften clay soils, or convert clay to loam. Myth #2. Gypsum lowers the pH of alkaline soils. In very high pH soils (pH > 8.5, characteristic of high- sodium soils), gypsum will lower the pH, but only slightly. At lower, though still alkaline, soil pH values, gypsum has little or no effect on pH. Chemically, calcium sulfate is a “neutral salt”, i.e., when it dissolves in water, it does not change the pH of the solution. If the objective is to lower soil pH, elemental sulfur, iron sulfate, or aluminum sulfate should be used. Myth #3. Inoculating soil with microbes or microbial preparations, will improve “dead” or infertile soil. A wide variety of “microbial” products that contain (or claim to contain) microorganisms are commercially available for farm and garden use. A review of the claims made for such products is beyond the scope of this bulletin. Keep in mind that most soils, including soils that have been fertilized only with synthetic fertilizers, or have suffered years of abuse (compaction, erosion, loss of organic matter) still contain a great diversity of microbial species. 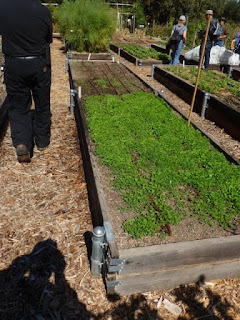 To establish or re-establish a healthy soil food web, all that is needed is to apply a variety of organic amendments and ensure that pH and nutrient levels are adequate for plant growth. The benefits of adding compost to the soil. The benefits of topping garden soil with mulch. The benefits of cover cropping.